Whether you are a service provider or run a retail store or office building, the front windows of your business tell prospective customers a lot about what can be found on the inside. 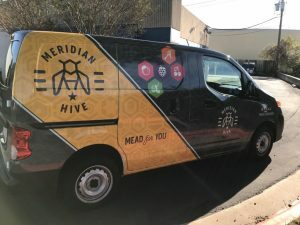 Whether you are marketing special services or products, want to provide your patrons inside with privacy, or just want to educate prospective customers on the things you have to offer them, having high-quality vinyl graphics and window signs can help you achieve this. 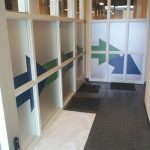 Saber Sign Solutions is your local partner for window graphics. We create eye-catching, attractive window displays, graphics and clings to get your business and brand noticed. Call Saber Sign Solutions today at (512) 861-2699 for a Free Consultation with a Window Signs Expert! Saber Sign Solutions makes the best window graphics and signs for all of your business needs. Our talented on-site graphic designers can help you create custom window graphics to match your current branding, support your goals, and get your message across to your customers. Are you unsure of what vinyl products are the best to meet your unique needs? That’s not a problem! 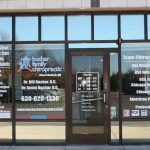 When we meet for your Free Consultation our window signs specialist will discuss all of your sign needs with you, and recommend the very best vinyl solutions for your location, budget, and business. Much emphasis is placed on window displays by retail stores. There is a very good reason for this! An appealing, eye-catching window display attracts people into your store. If you are running a sale, special promotion, or would like to draw attention to a certain product, then a great way to do that is with your window displays. Window displays are typically updated seasonally in order to feature your hottest, newest items. We can provide compelling and attractive window graphics, banners and signs to you to help promote your products, sales, and events in a very professional way for both short-term and long-term use to attract more customers. Using privacy film on exterior windows is another option that is commonly used for window buildings, like real estate agents, therapists, counselors, or law firms. 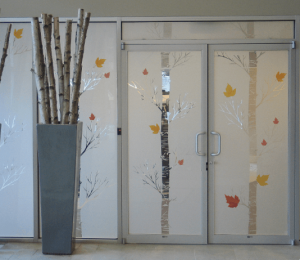 We can provide privacy film to you that either has a frosted or etched glass finish, which the permanence and expense of frosted glass panes or panels. For branding purposes, many offices include their name, logo or another image in their privacy film. We can create a unique privacy film that is custom made for your business, or we have examples we can show you of popular film options so that you can make the best decision for your company. You don’t need to sell retail products in order to have an attention-grabbing and attractive window display! 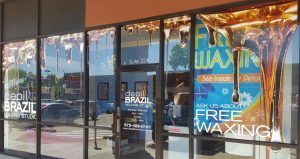 Use graphics to dress your windows up and celebrate your special offers, most profitable services, or have a window mural created that demonstrates how you can best serve your most desired customers. Our talented sign designers can work with you to get the perfect display created for your needs and business. Our full-service sign shop helps to create, and even install, your graphics. From the initial design stage all the way through to professional installation, we are here for you every step of the way, to create the professional window displays, graphics, and signs you need for attracting more clients or providing privacy to people inside of your facilities. 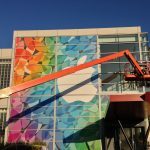 Whatever your specific business goals are, Saber Sign Solutions will create the ideal solutions for all of your business windows.